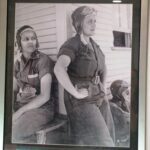 During a cross-country road trip last month, I stopped in Sweetwater, Texas, where the Women Airforce Service Pilots (WASP) trained at Avenger Field during WWII. The surrounding landscape is dominated by forests of huge windmills stretching to the horizon, with farms and small towns dwarfed below. In places there were so many, it was a bit eerie. As we turned off Interstate 20 and approached the WASP museum, we imagined the women pilots of the 1940s would have been startled to see these white giants scattered across their training grounds. The WASP Museum is located in a hangar at Avenger Field. Admission is free. A friendly woman with a wonderful Texas accent was there to give us a short guided tour of the exhibits and answer questions. A gift shop had books, t-shirts, and posters for sale. The museum is small but has some very memorable exhibits. One of these was a target flag donated by former WASP Beverly Beesemyer. We smiled at the thought of this pretty girl next door flying a military plane out in the desert, towing this surprisingly small cloth flag (about 2 feet square!) for the male pilots, who used it for in-flight target practice. It is pockmarked with colorful bullet holes. The bullets were color-coded by pilot to later see who was hitting the mark most often. A video interview of Ms. Beesemyer plays in a loop, so we were able to hear her speak firsthand about her adventures. We felt grateful someone took the time to record her story in this way. We were able to get a glimpse into the daily life of the WASP with the barracks display. Small, tidy beds and wooden wardrobes were arranged against the walls, with study desks in the middle of the room, just as they were in the 1940s. A spartan lifestyle focused entirely on flight training! Though surely a box of candy or two was hidden away once in a while? Also in the museum is one of the instrument simulators used in WASP training, with a complicated arrangement of gears and circuits to work the instruments and record the pilots’ inputs. We marveled at the things accomplished back then without computers! During a recent reunion at the museum which included big band music, all attending WASP made hand impressions and wrote their names in cement slabs. These are displayed in rows in the museum, with a corresponding 1940s photo and biography of each woman. What fascinating and diverse lives they led. Even today they would be an extraordinary group of women, but in those days they were even more exceptional–and in some cases, undoubtedly colorful! It seemed to me to have been a very special moment in time when these women were gathered here together, making history. As a side note, if you’re hungry while in Sweetwater, you’ve got to try Allen’s Fried Chicken. A real down-home Texas family style restaurant, you sit at large tables with other guests while fried chicken and about 10 sides are served up, all you can eat. When you’re done, you pay $9 per person at an old punch-button cash register. It was a great way to soak up the local flavor and meet some nice people. Windmills seem to stretch to the horizon in places around Sweetwater, Texas today. Former WASP Beverly Beesemyer talks about her adventures towing targets for the male pilots. The barracks exhibit, spartan and tidy. A WASP flight simulator, pre-computer! Who says ladies can’t be tough? The signatures of all WASP attending a fly-in in 2008 surround their mascot, Fifinella on an airplane’s door. This entry was posted in Aviation Events, News, The Pilot's Life and tagged avenger field, aviation history, sweetwater, texas, wasp. Bookmark the permalink.